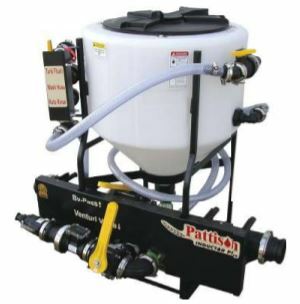 In 2013, Pattison Liquid Systems, launched a new line of Spray Management Systems. This line of products was developed after listening to the Western Canadian farmer explain the short comings of the current products that were available in the market place. The greatest concern voiced by the farmers was the extended time it took to fill the sprayer. The 2017 Pattison inductor spray mangement lineup will provide quick fill times and accurate measurement of chemical as it is inducted into the fill line. Pattison Liquid Systems continues to work with farmers to develop and add new products to the Spray Management Systems. Pattison’s Dry-Inductor comes completely pre-assembled. This inductor is equipped with a 30 USG cone bottom tank with no interior bulk head leaving behind no dry product residues. Once product is introduced into the tank with the use of the venturi, it will be passed directly into the liquid stream with high agitation and complete solubility of your product. 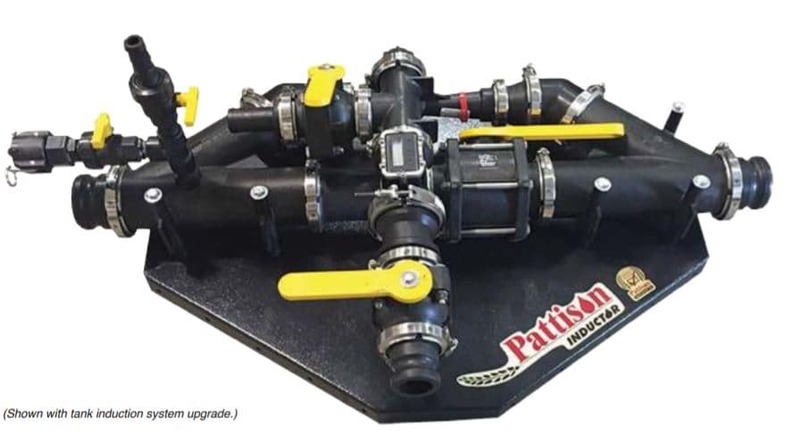 The 3″ plumbing comes with leak proof manifold fittings having the capability to flow 450 USG a minute. The compact size of the dry-inductor allows for easy mounting on a spray trailer with dimensions of 44″ wide and a height of 42″. The systems comes with a pre-installed Raven FloMax 221 meter measuring chemical with high accuracy (+/- 1%) as it is drawn from bulk containers, reading in litres or in US gallons. This high volume system is available with 3″ flanged style fittings for high capacity drawing of products. Integrated with a fresh water rinse allowing fast cleaning of the system, as operator switches from one product to another. The Chem-inductor upgrade kit allows operators to use the inductor on pre-existing Chem-handler systems. This upgrade provides the high capacity venturi to draw from existing chem tanks and a supply of fresh water as well. 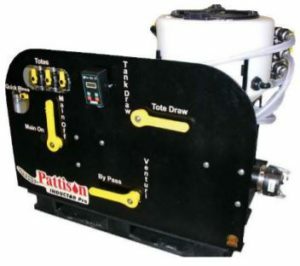 The Pattison inductor plus, spray management system has been designed with todays operators in mind. This neat compact design will take up less space being adapted to fit in tight spaces on your spray trailer. 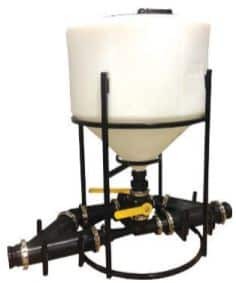 The 3″ plumbing design integrated with the high capacity venturi, will have the sprayer filled and back in the field in no time. The batch tank empties and rinses jug containers ensuring that no residue is left behind. The optional bulk metering system allows for precision product drawing from bulk containers. Included in the system is a fresh water hose allowing for clean ups on the spray trailers or rinsing of batch containers. With the turn of a handle activates the venturi to pull product directly from the bulk containers. The venturi will move product in excess of 100 liters a minute, ensuring product is in the sprayer tank before it is filled. The inductor plus comes with the option of including a Raven Flowmax 221 meter for precision drawing of bulk containers. The inductor pro is the next generation of spray management systems, allowing for greatly reduced fill times to spend more time spraying. The high capacity induction system can be attached to up to 3 separate bulk containers at the same time. As the sprayer is being filled through the 3″ fill line, product is inducted straight in to the fill line. The system is powered by a proven performance 13hp PowerPro electric start motor. The 3″ Hypro pump will deliver up to 440 GPM. Product that is being drawn from each bulk container is accurately metered with the Raven FlowMax 110 monitor. One step calibration allows for accuracy of +/- 1% and compatibility with most agricultural products. This meter has the potential to calculate flow rates, batches, and total volumes. 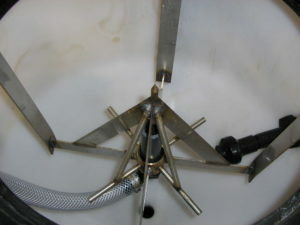 The 30 USG on board tank allows for operators to empty and rinse jugs quickly. The adaptability of the inductor pro allows for easy integration into existing systems. Available as an option is the FlowMax 810. 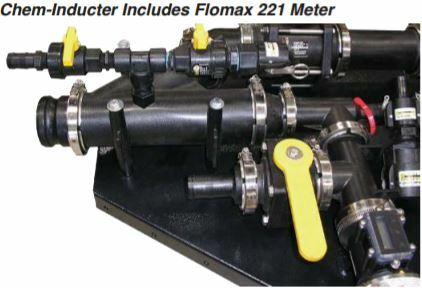 The FlowMax 810 when integrated with a shutoff valve, allows for the operator to pre-program a batch volume. When the correct amount of product is measured out, the FlowMax 810 will automatically close the intake valve. The 2017 Pattison inductor spray management lineup will decrease your spray times allowing for more time in the field! For more information on the 2017 Pattison Inductor Lineup click here, or contact us. Below is a video of the Inductor Pro in Action!